A big-screen version of Stephen King's Dark Tower book series has been in the works intermittently since 2007 with JJ Abrams and Ron Howard attached at different stages. The task eventually landed with Nikolaj Arcel (A Royal Affair) who directs and co-writes, and has turned the brutal text into a disappointing YA fantasy adventure. Arcel nods to King's vast canon of work throughout the film and though his inspirations, such as Tolkien's Lord of the Rings, are heavily referenced this adaptation has none of the epic and awe-inspiring appeal of Peter Jackson's film franchise. 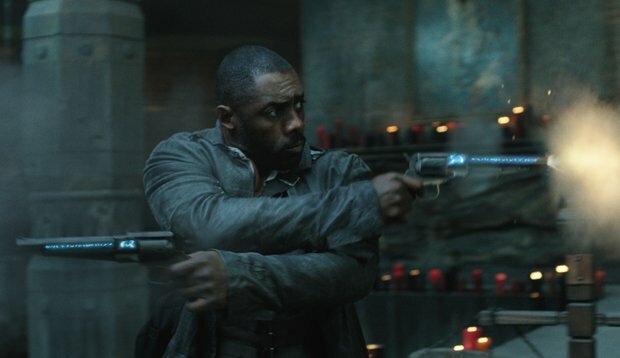 Idris Elba plays gunslinger Roland, who acts as a gruff guide to the young Jake (Tom Taylor) in Mid-World. Elba turns in a decent performance, despite the amount of exposition he and the rest of the cast are forced to randomly insert to keep the viewer up to speed. Roland first appears to New Yorker Jake in one of the nightmares that have been plaguing him since his father passed away. As the pair slip between worlds via portals in order to save the titular tower that keeps darkness away from the universe, they strike up an enjoyable friendship. Elba plays the fish out of water with a dash of comedic charm and Taylor proves a sweet sidekick. Matthew McConaughey as the Man in Black and villain of the piece appears to be doing an impression of Viggo Mortensen in The Prophecy. However, he's not able to pull off evil as convincingly as Mortensen, making his performance comical for all the wrong reasons. As the heroes rush from one set-piece to the next battling monsters and shooting bullets there's little tension or gravitas attached to their journey. Arcel rarely conveys a sense of crippling fear to the audience, despite the fate of the entire universe being at stake. General release from Fri 18 Aug.